Only a couple days before the 3rd issue of IDW‘s new on-going Sonic the Hedgehog series hit shelves, but the IDW Sonic Comic Squad, the official source for the latest news regarding the book, has treated us to the first 5 pages early! This issue marks the IDW debut of Jen Hernandez with colorist Heather Breckel. Per usual, the story is by Ian Flynn. Take a look for yourself below! Happy Monday Sonic Comics Squad! Are Monday’s really happy though? They certainly are when they feature the EXCLUSIVE PREVIEW of Sonic The Hedgehog issue #3! Catch it for the very first time, only here at the Sonic Comics Squad! 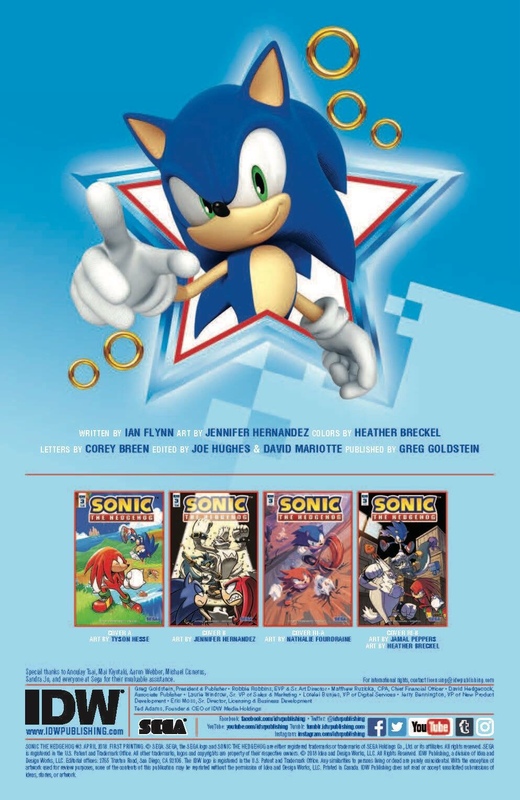 Additionally, Jen will be illustrating the B cover, Nathalie Fourdraine will reprise her RI-A territory, and Heather Breckel will be coloring Jamal Pepper’s first IDW Sonic work!